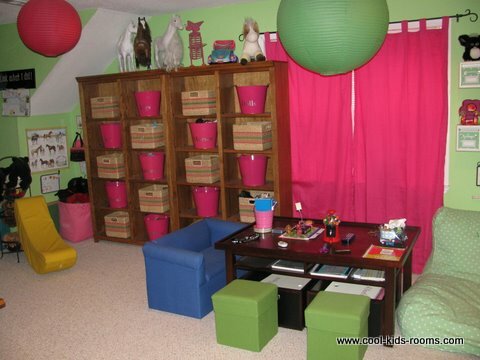 This playroom has many different areas in it. One side of the room has 2 queen size beds for when company comes. The other side has a lounging area, one desk for the computer, one desk for crafts and another desk for when my girls have their friends over and they hold club meetings. I have 2 leather chairs in the room also and that's where the adults can sit, visit with the kids, and listen to some music on the I-Dock. There is burber carpet in the room and I added a 8x10 hot pink rug in the room from Crate and Barrel to add to the pink and green theme in the room. Also, I have pink and green paper lanterns spread throughout the room on the ceiling. This is the desk where my girls hold their club meetings. I purchased it from Pottery Barn Kids and they each have little stools to sit at. The pink and green baskets/bins are from Pottery Barn Kids and the metal pails have names on them of what is in each pail. 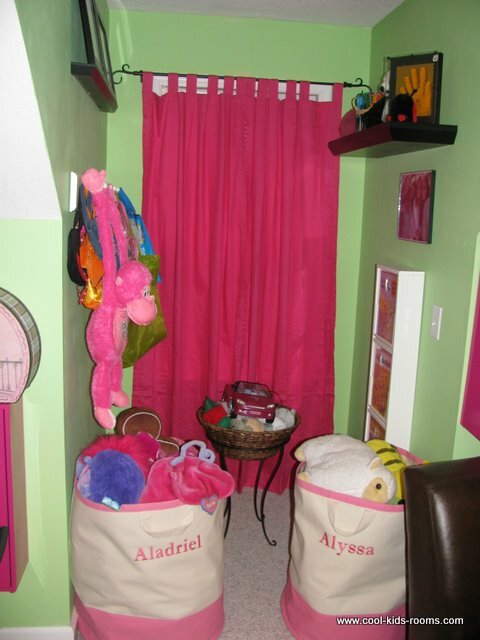 You can also see the hot pink curtains that were recently hung up and they really add to the rooms color scheme. These are the lounge chairs that I matched the color of the walls with, I wanted to get as close as possible. The chairs were purchased from Pottery Barn Teen and they have my girls names on them so they know exactly where to sit every time. The polka dot bins up above the chairs, each pull out and have small accessories in each one of those. This corner is used most for when my girls are reading, you can see the bookshelf on the wall and that was purchased from Pottery Barn Kids. Also, they play their video games here also. The clock was put up on the wall so their friends knew when they had to go home (after hours of playing in this room, everyone forgets what time it is). 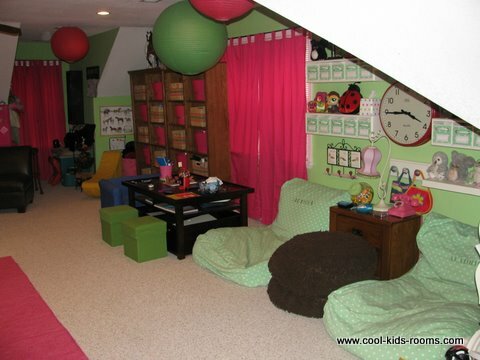 This playroom is 50 feet long so it was hard to get an entire view of the room. This is just one side of the room. The other side has the beds in it and along the wall, I have hot pink frames lining the entire wall and in those frames are photos of my girls with their friends that they have had over in the past. I tried to decorate every inch of space there is in this room. There are 2 dormers in this room and this is one of them. The rack on the left, holds purses. While the other side has a magazine rack for all their teen magazines. Stuffed animals started taking over the room at one point so I purchased from Pottery Barn Kids these totes with their names on them to keep all their furry little friends. Is another view of the entire left side of the room. 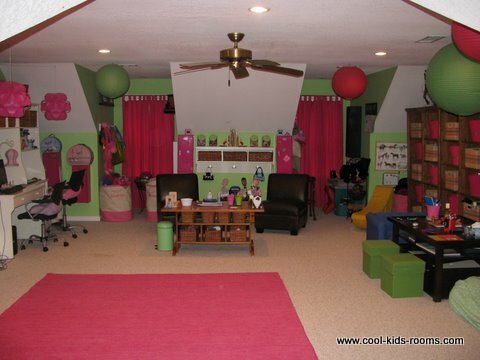 As you can see this room is very inviting and my girls are 9 and 12 and they spend hours at a time up in this room. Whether it be play on the computer, listen to music, or just hang out and talk on the phone with their friends. Everyone that has ever come to my house always comments on this room and they never want to leave. I Love, Love, Love your room. I am using these pictures as inspiration to decorate my daughters playroom. It is much smaller and has a built in desk in the center of the room. 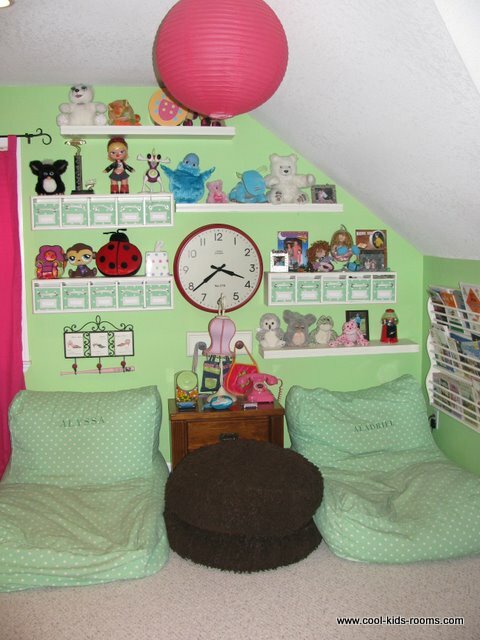 I think I am going to paint the walls light green and put pink and green polka dots on the walls. Where did you find the paper lanterns? I love this room. It looks great. I have a small den next to my living room that is our computer room and the kids playroom. I wish I would fix it up so the kids would have a place to sit and play and put all our toys. We also have a small pool table in there too. If you have any tips, I would love to hear it.